Recently, we announced that the University of Texas at El Paso’s (UTEP) Campus Transformation Project was awarded SITES Silver certification, in addition to becoming the first project to certify under SITES v2. We sat down with some of the project team members to get their insights into pursuing SITES at the Campus Transformation Project (CTP). Heather Venhaus is principal of Regenerative Environmental Design in Austin, Texas, and was the sustainability consultant to the project, and Christine Ten Eyck, FASLA is president and principal in charge of UTEP’s CTP. Why did you choose to pursue SITES certification at UTEP? 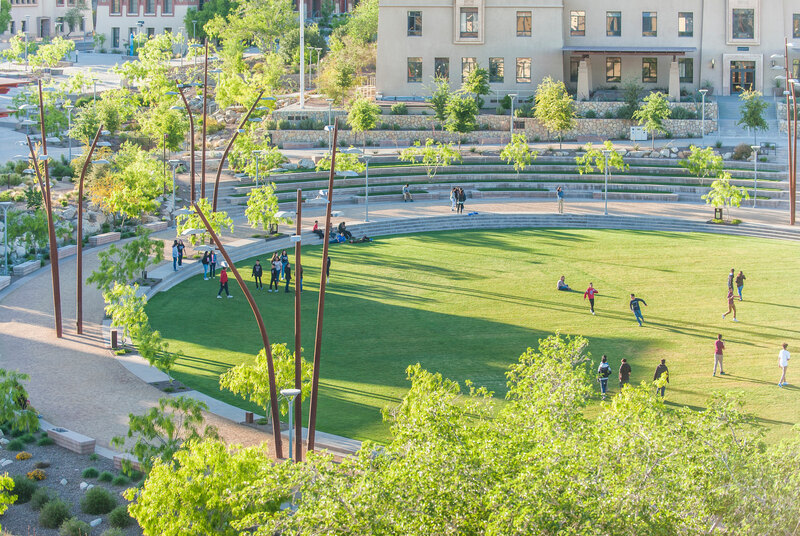 Christine: We, as a design team, felt the CTP would be a great project for SITES because we would be transforming a vehicular-oriented core campus into a community landscape that created social and recreational spaces, while linking the campus with the surrounding watershed and Chihuahuan Desert region. We mentioned the possibility of SITES to the university, and they enthusiastically supported pursuing SITES certification from day one. We knew it would be ambitious being an 11.5-acre site, but being a research university, we felt it was a great fit. What makes the Campus Transformation Project so remarkable? Heather: The CTP is a great project for many reasons; however, I am most proud of the social equity, human health and stormwater achievements. The site is located on the U.S.-Mexico border in the El Paso-Ciudad Juarez binational metropolitan area. More than half of the University’s students are first-generation college students. The site provides public access to a sustainable landscape that is unique to the El Paso region. Visitors can experience mental respite, socializing and physical activity in a space that reflects the natural beauty of the Chihuahuan Desert eco-region. In addition, the 98th percentile stormwater event is managed in vegetated arroyos and acequias that mimic natural desert waterways. The stormwater system connects the Franklin Mountains in the upper portions of the watershed to downstream arroyos and allows visitors to witness and enjoy sustainable water management. Christine: It was remarkable for our design team, in that concepts we took to the interview after analyzing the site were accepted wholeheartedly by the client. 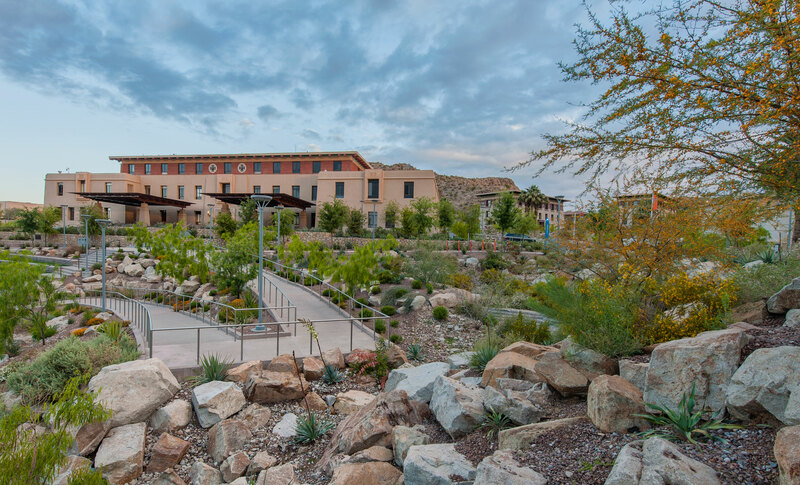 The campus embraced accentuating stormwater through campus into arroyos and acequias as a key aesthetic and functional feature that speaks to the culture of the southwest. To think that a student in the desert southwest, where the rainfall is under 10 inches per year, can now walk to class on bridges over gurgling rainwater during a storm with fragrances and sights of nourished desert plants, where before there was heat-absorbing asphalt, is making a mirage in the desert a fantastic reality. This project has been a highlight for our careers because of the students and faculty who have embraced this new central space. The intense collaboration this project took between our firm, as the landscape architect, and other team members, including engineers, architects, contractors and campus leaders, instilled the experience of going through something major together. It wasn’t easy, but in the end it was worth it. This project is a testament to how important our profession of landscape architecture is to people’s everyday lives—we have the power to turn bleak, sterile, soulless expanses into beautiful, culturally significant and functional healthy environments. How does SITES add value to your landscapes? What are the benefits of SITES certification? Heather: SITES provides third-party verification and outside recognition of sustainable landscape design, construction and maintenance achievements. SITES also supports an integrative design process, and requires the design team, contractors and maintenance professionals to work together to achieve performance goals that can be easily communicated to demonstrate the success of the project. Christine: UTEP is extremely happy to achieve this rigorous certification for their school. The site acts as an outdoor living laboratory for students to study native plants and stormwater technologies. It is also a place for social interaction—whether small groups or large community events. 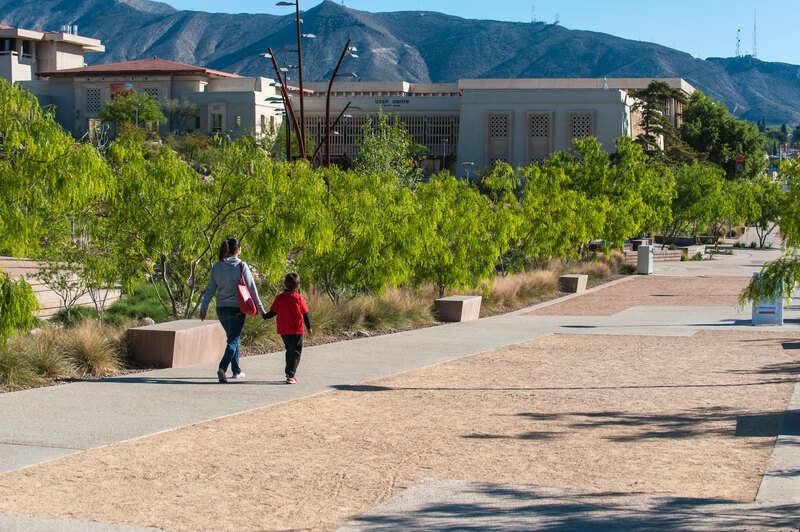 The green infrastructure technologies and aesthetic are now an urban model for El Paso and the Chihuahuan Desert region. When it comes to sustainable landscape design, operation and maintenance, what unique challenges does the SITES rating system help overcome? Heather: I have found the SITES prerequisites to be a helpful tool for communication and maintaining best practices throughout all stages of the project. One example is soils, which are often identified as an area of cost savings or where lower quality materials or construction practices are commonly accepted. SITES recognizes the importance of soil in a sustainable landscape, and the prerequisites and credits support teams in establishing expectations and verifying quality and performance. Another example is the prerequisite for a sustainable site maintenance plan, which is developed by the design team and maintenance professionals—two groups that strongly influence each others' work, but all too often do not get the opportunity to work together. This prerequisite encourages early coordination, a shared vision for the long-term performance of the site, and agreement that the goals can be accomplished. The maintenance plan also provides the owner with clear plans for short- and long-term site maintenance. How did conducting a pre-design site assessment positively impact the project? Heather: The prerequisite for a pre-design site assessment reinforces project benefits that can be found in design and construction when the project team has a solid understanding of the opportunities and constraints of the site. It also provides a clear benchmark of the existing ecosystem services provided by the site, and what the project has diminished or restored through the development process. This type of information is essential to the continued growth of the sustainable design industry and our efforts to develop regenerative systems. Christine: Collaboration is the key. It is one thing to have the idea about carving new arroyos and conveying storm water, but you need engineers as part of the team to help make it happen. Each profession collaborates with the team to ensure the best minds are working together towards the big ideas. If you were to give advice to anyone considering SITES certification, what would you say? Heather: SITES is most successful and more likely to fall within budget when it is considered from the beginning of a project and incorporated into each phase of development from design to construction. SITES professionals who work closely with the design team can help embed the necessary criteria into design solutions and construction documents, so that the requirements are clearly understood and are integral to the success of the project. Christine: We, the design team, were so busy with design, meetings and deadlines. I believe for a project this size, it is best to have a consultant well versed in SITES, like Regenerative Environmental Design was.